Children watch the rain from under an umbrella. Piper Crowe looks for bids in the crowd. 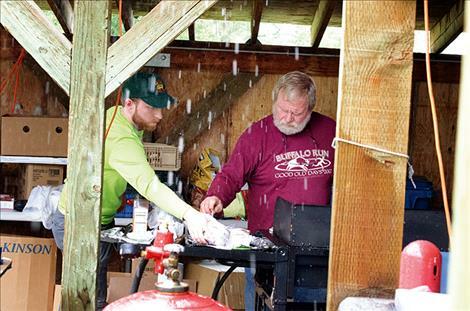 Volunteer Firefighter Ray Frey cooks hamburgers under a protected shelter. A boy plays on the bouncy slide while the rain pours down. 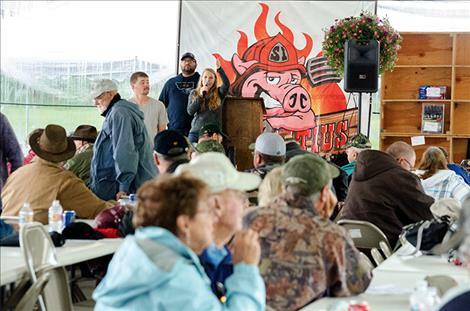 ST. IGNATIUS – The constant pour of rain during the 24th annual Fireman’s Auction on a cloudy Saturday didn’t bother nine-year-old Levi at all. 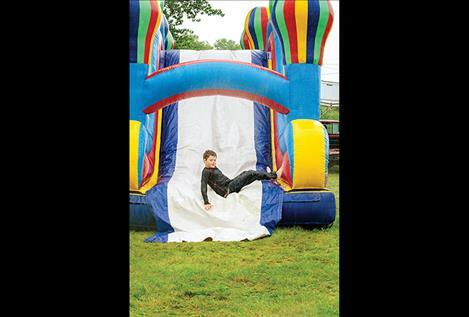 He was one of three kids enjoying the inflated bouncy slide without a crowded line this year due to the rain. “This is so fun, and I’m not even cold,” he said while water dripped from his clothes. 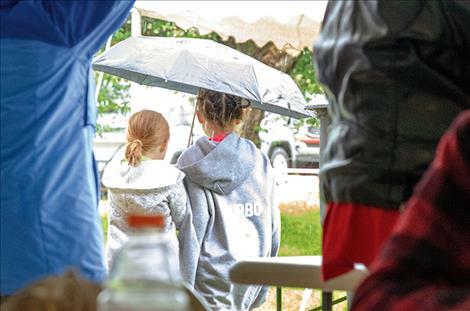 Several hundred participants stayed dry under the awning at the Old Town Field during the auction and picnic to raise funds to support the St. Ignatius Volunteer Fire Department. Volunteer firefighter Ray Frey was flipping hamburgers at the end of the food line. 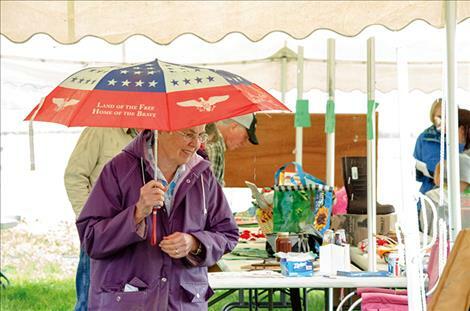 He said in the past when it rained it usually quit during the auction. Frey said last year’s auction brought in $19,000 to help support the department. This year’s total is still being calculated, but Frey said he hopes it’s enough to allow firemen to attend a few training classes. The training programs, he said, would be focused on saving lives after car wrecks. Firefighters encounter a number of different vehicle models when responding to wrecks, and how they respond depends on the type of vehicle, he said. He said the department would like to send a few firefighters to training programs to learn about vehicle changes so they can come back and share the information with the rest of the department. He said he was grateful for the donations from community members and local businesses. “I think our local businesses must get hit up by every organization and thing that’s going on and they seem to be able to help in some way and I admire that,” he said. 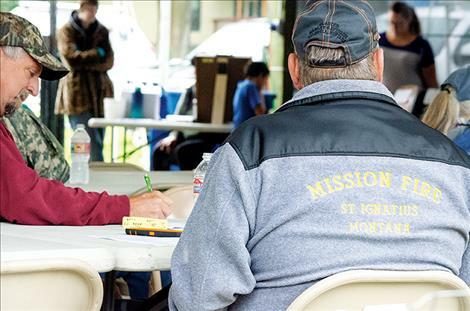 This year, the long list of donated items included fireworks, coats, decorative rocks, firewood, paintings, hanging flower baskets, several portions of bacon, carved wood items, and even a two-hour session with a tattoo artist from Missoula. 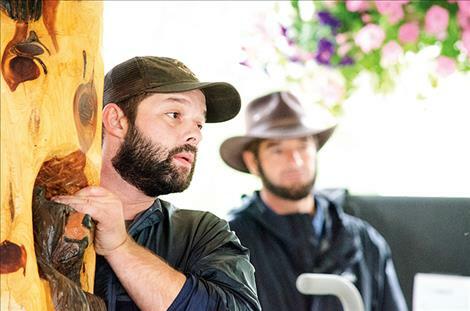 Frey said two coffins are among the most interesting items on his list of donations. He is expecting the coffins to be donated next year. He said the person donating them wasn’t able to organize the donation for this year, so they plan to donate two coffins next year. 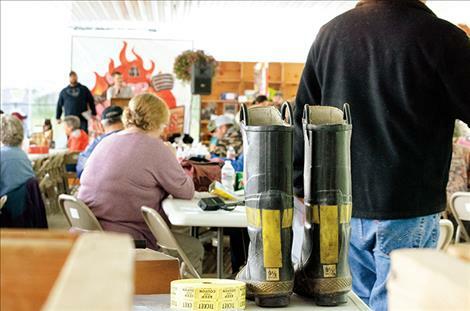 During the auction, Piper Crowe’s musical auctioneer’s voice could be heard chanting out the numbers while firefighters and other volunteers held up the items and took bids. 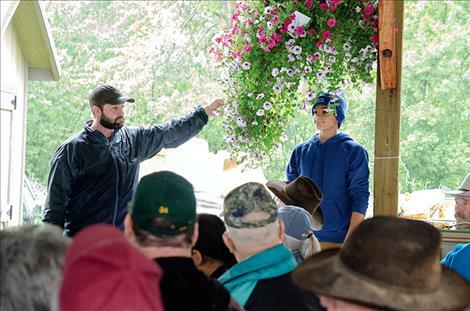 Travis Jeppesen also took a turn auctioning off items. 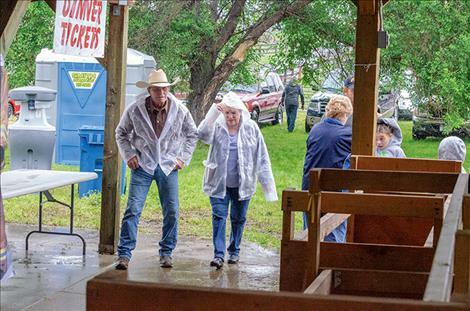 The auctioneers, with Rivers West Auction, volunteered their time and equipment. 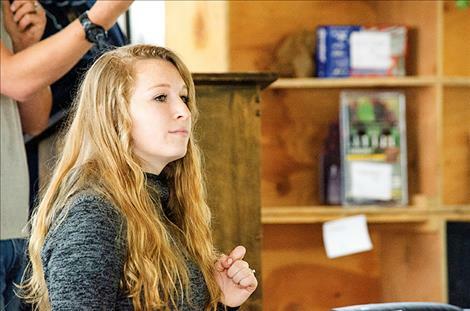 Volunteer Annie Morigeau stood up to announce the fire department’s scholarship winners. She said the $500 scholarships were a way for the department to give back to the community for the support. She said Leila Marsh and Philip Vaughan are this year’s scholarship recipients. 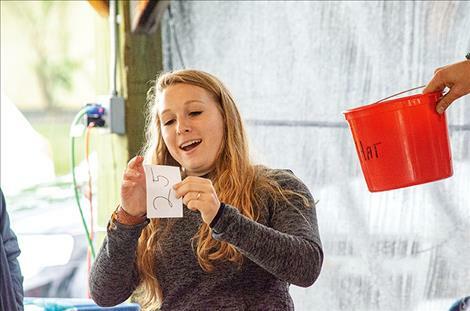 To qualify, the high school students needed to complete 100 hours of community service. The scholarship awarded again next year.